I woke up bright and early today and zoomed over to Marie's house in the San Gabriel Valley. From Mid-City it only took me about 35 minutes to get there. Wow!!!! What a fantastic sale. Marie and many of her yarny friends brought their craft supplies, etc. to sell. I'm so glad I got there early...I had my pick of the booty. The photos below tell the whole story! I ended up purchasing some gorgeous, pristine Wool Ease (for this year's holiday gifts); some vintage wool with matching fabric; some more wool; some more and some more. I didn't overspend (everything was priced to sell) and I came home with some lovely yarn and fabric. Marie had set aside this gorgeous, vintage hot pink Sayelle for me. I started crocheting granny squares on the spot with it. 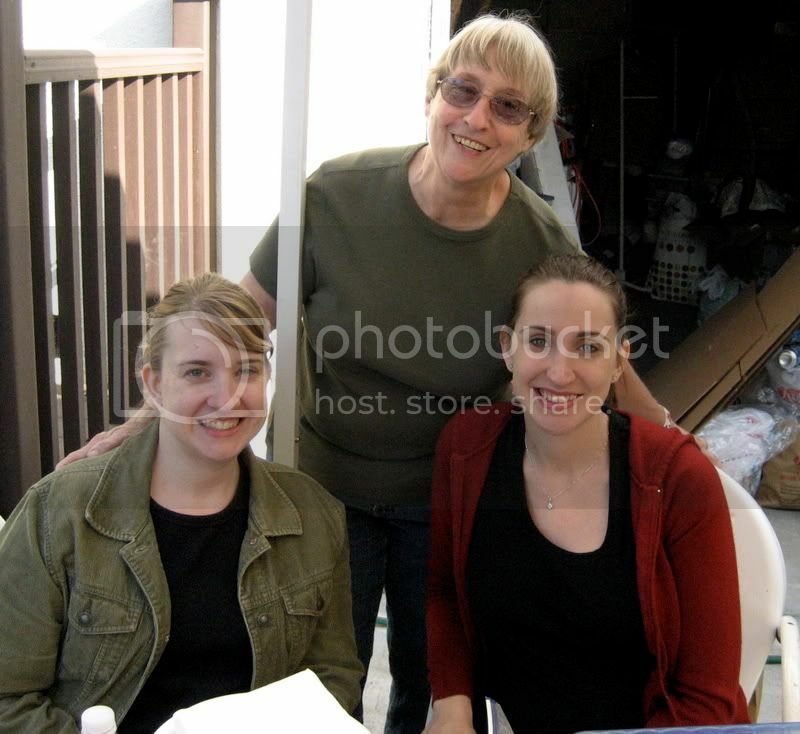 Many of our WeHo SnB members dropped by....Faith, Jenna, Christine, Mary Jo and more. 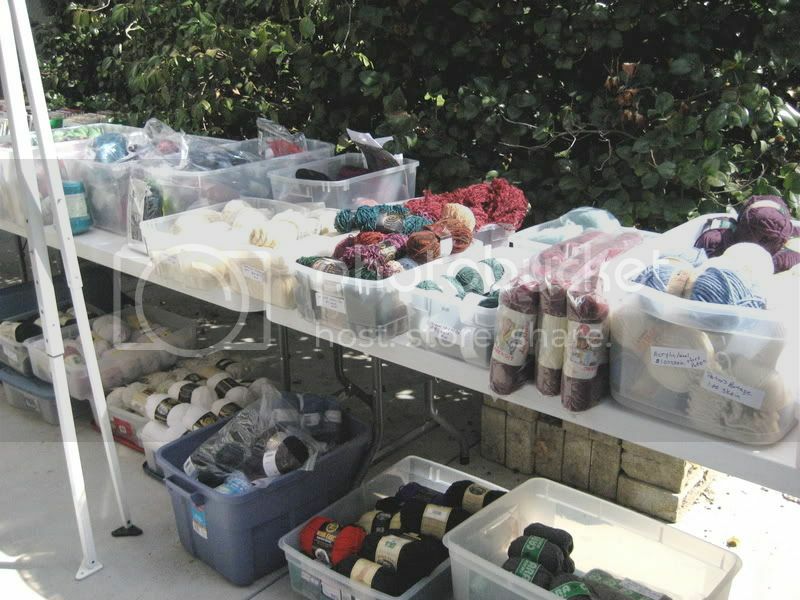 Thanks to Marie and her band of Yarn Pushers for holding an incredible sale! A few weeks ago, while sitting backstage with the Yarn Harlot at the LA Central Library before her presentation, Audrey and I were chatting with Stephanie about our vast yarn stashes and how we feel guilty owning so much yarn. 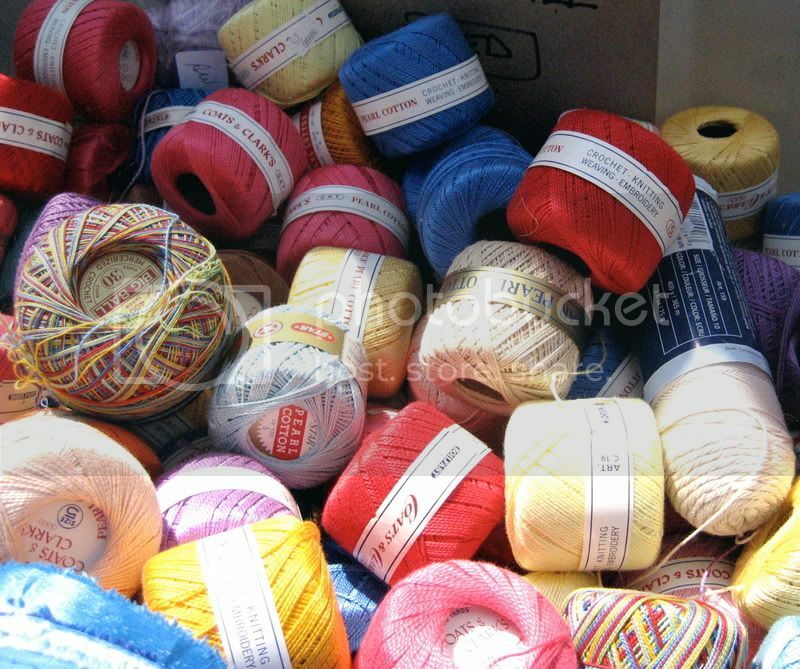 The lovely YH gave us the perfect rationalization for gathering and storing yarn. Here's what she said, "Are you going to retire someday? 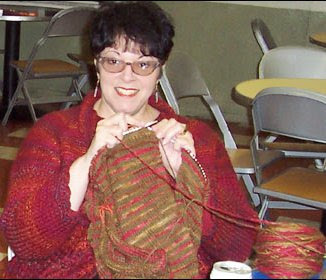 Will you be knitting and crocheting more once you retire? Will your income be limited when you retire?" Audrey and I replied "yes" to all of those questions. 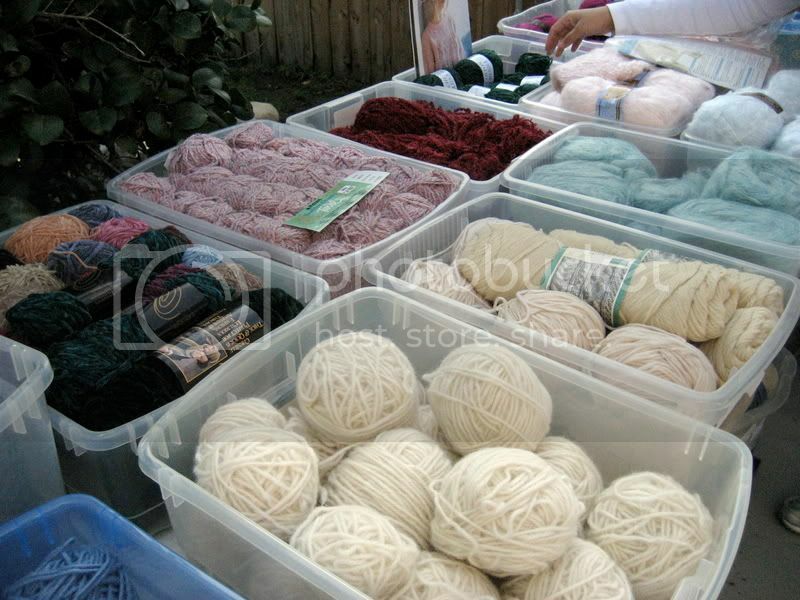 "Well, then," Stephanie replied, "you are merely stockpiling yarn for those lean years of retirement!" I do love the Yarn Harlot. I've been photographing my stash for Ravelry. Since I have Larry's photo studio, lights, seamless background, his expertise, etc. at my disposal, I thought I'd do the job the right way. After Larry helped me set up the lights, I snapped tons of shots of yarny goodness. I think this makes an orgasmic slideshow. The possibilities are endless. I will be at Marie's house on Saturday morning for the yarn and craft sale. I need to add to that stockpile. Hope to see you there. Can't wait to add that hot pink Sayelle she promised me to my stash photos! On Sunday, Rhoda and I will be attending the L.A. Conservancy's "Cultivating L.A.: 100 Years of Japanese-Style Garden Making in Southern California, A Self-Driving Tour." Have a marvelous weekend! One of my co-workers is having a baby. I always like to knit or crochet a little something for the new arrival. 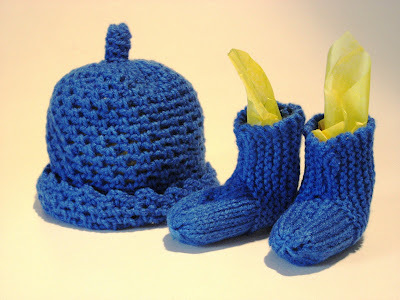 I found this darling sock/bootie pattern online. It was a quick knit. I used DK weight mystery acrylic found in my stash. I like this bootie pattern so much, that I might enlarge it to adult size, using bulky yarn and make a few gifts. I added a little crocheted hat for my co-worker's baby boy. I made up the hat pattern as I went along. Basically, it's the granite stitch, increased to about 3 inches, then edged in a picot stitch. Oh! One More Announcement - Check out Madgik's post today about a super-duper crafty sale on Saturday!!! 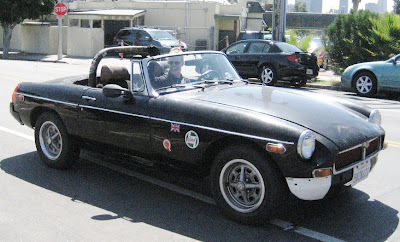 Larry and I were just walking into Brite Spot Cafe for breakfast on Sunday and who do I see speeding down Sunset Boulevard? 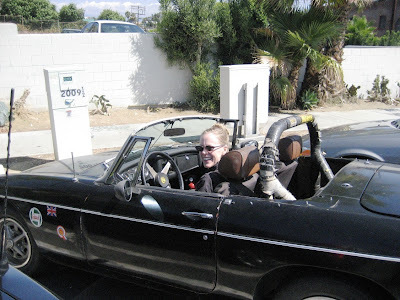 Brit, of course, in her jaunty vintage MG. I think I actually HEARD the car before I saw it. I quickly called Brit on her cellphone. She turned around and joined us for a quick bite. I just love chance meetings like this in our beautiful City of the Angels! 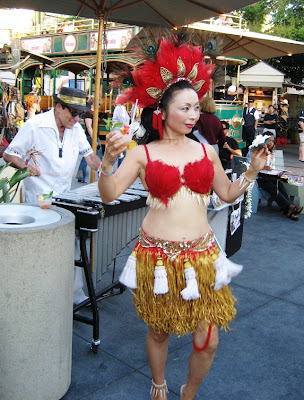 Over the weekend we went to the LA County Fair in Pomona. It was pouring rain. We thought this would be a perfect time to visit......no crowds, cool (wet) weather. It rained off and on during our visit. When we were about to leave it poured! We stayed inside alot. We visited the Millard Sheets Fine Arts building. There was a 100 birthday tribute to Mr. Sheets. 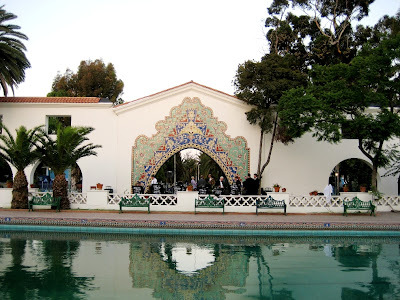 On display were many of his paintings, architectural renderings, photos, mosaic and tapestry designs. He was a multi-talented artist as well as a respected educator. I was most impressed by this show. The Fair runs through this Sunday, so if you have a chance, you really should get out there to see this exhibit. We ran into Charles Phoenix at the Sheets exhibit, leading a tour group around the highlights of the Fair. Next stop....the Tapestry Arts Building. 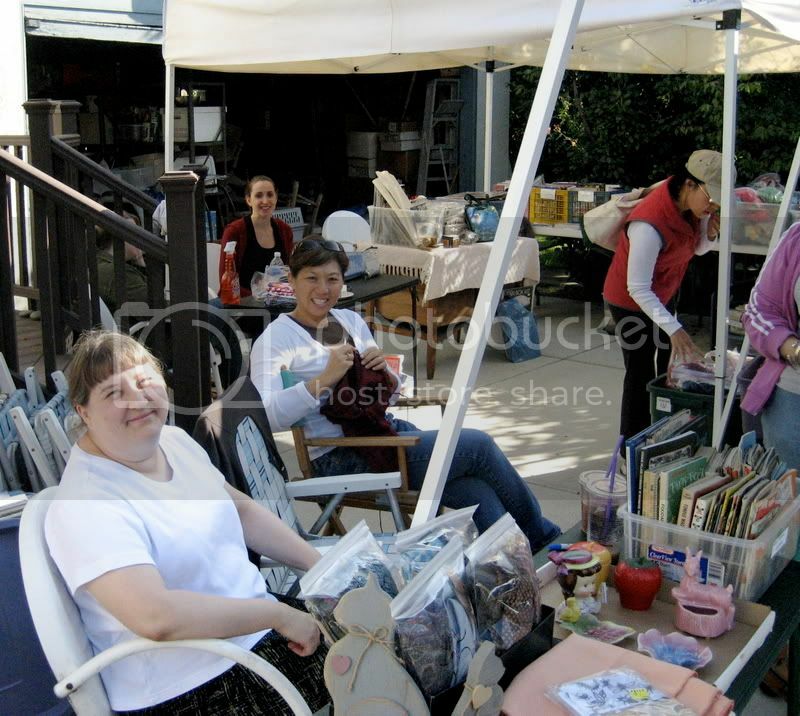 My friend, Cathy of California was there, giving demonstrations on making pin-cushions. Her booth was quite popular. 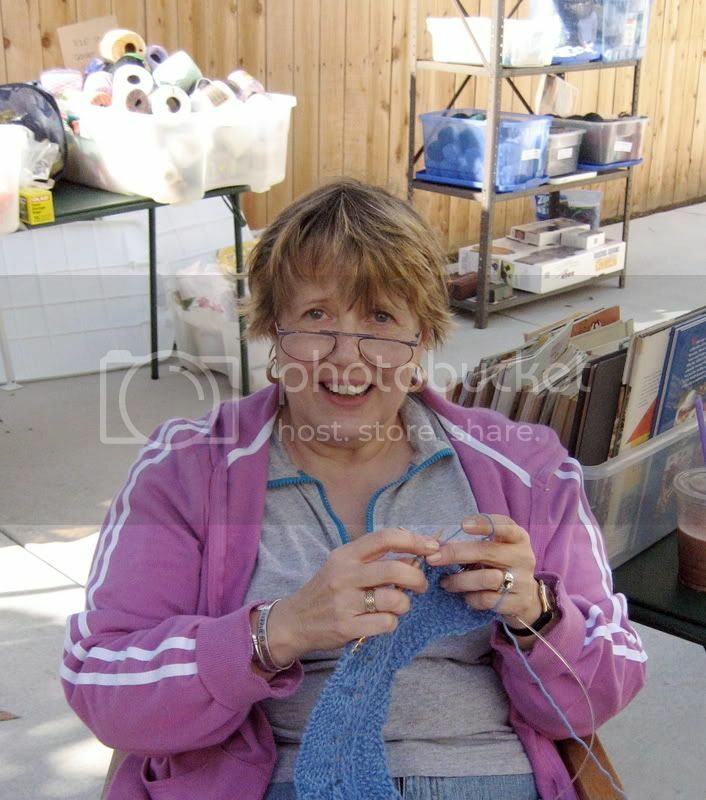 She was joined by one of the founders of The Felt Club, Jenny Ryan. I also ran into fellow SnBr, Beth, along with her family. After about an hour in the Tapestry Building, ogling all of the crochet, knit, needlepoint, quilt goods, I wandered over to the Food Arts side of the building. There were cooking demos, displays of baked goods, the table setting competition, pottery exhibits, etc. I wound up back at the crochet area where a group of ladies were joining squares for Warm-Up America afghans. I helped out, joining about 10 squares for a lapghan to be donated to a nursing home. The food at the Fair is amazing. 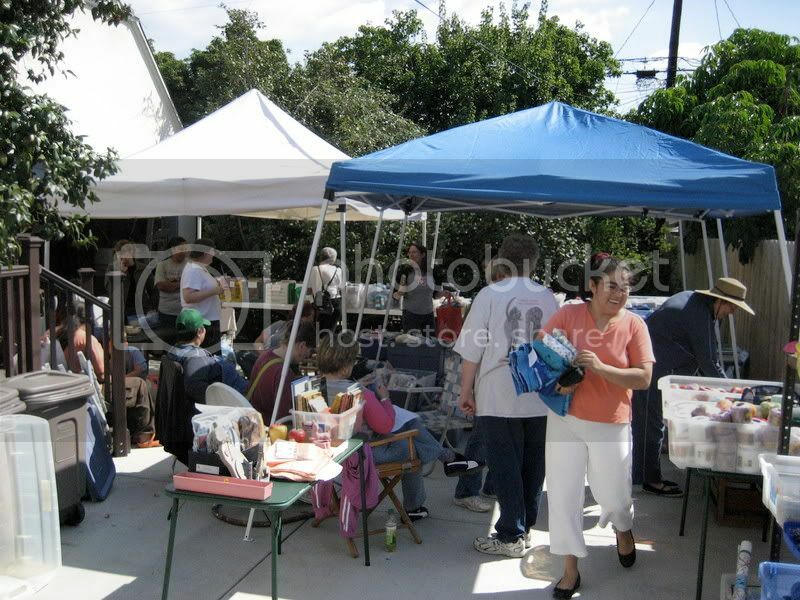 Tacos, hot dogs on a stick, onion rings, barbecued turkey legs, deep-fried twinkies, cupcakes....the list goes on and on. Needless to say, it was a fun, wet and exhausting visit. Ran across this pattern online and had to try it! I used the leftover Paton SWS, Soy Wool Stripes in the Geranium colorway. The author used Manos del Uruguay wool, which is really gorgeous, but slightly heavy for me. Then, I found this online video, showing another way to do the stitch. Thank you, internets. The Museum of Making Music is a non-profit organization located in Carlsbad, California that curates public exhibits that relate to the history of American popular music, the manufacture and retail of musical instruments and the history of the music products industry from 1890s to the present day. The museum's galleries consist of more than 450 vintage instruments and artifacts on display, hundreds of audio samples of popular music and an area for visitors to interact with a variety of live, hands-on instruments. 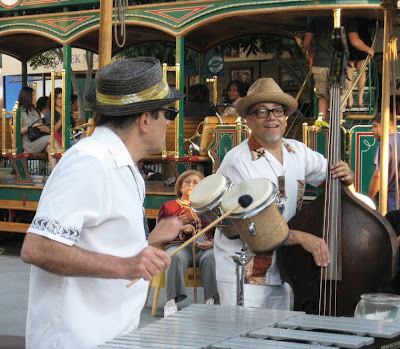 The museum also organizes public events, performances and lectures whose purpose is to entertain, educate and inform audiences of the benefits and heritage of making music. Larry and I really had a lot of fun ogling all of the historic instruments, interacting with the visual and audio displays and scoping out the giftshop. The best part...they were featuring an amazing exhibit on the history of the ukulele! This place is a "must-see" if you're traveling south on the Coast! Have a marvelous weekend everyone. I will be atoning for my sins during the high holiday of Yom Kippur. 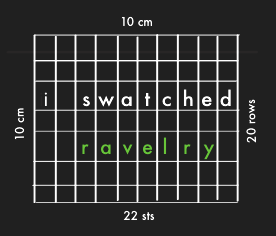 Ravelry is the knitting/crochet version of MySpace! I have friends. We've corresponded and made dates. We love looking at each other's projects. We all love the same patterns and yarns. It's a total mutual-admiration society!!! I'm still uploading projects, stash, books, projects I want to create, etc. I'll be updating this site for the rest of my life!!! Gotta go....more uploading to do! I finally received my invitation to join Ravelry. I've been uploading photos of projects, stash, etc. trying to align myself with the machinations of this great community! My name is Ellblo, so if you want to be my "friend", feel free to click away. I've only joined one group...the Crocheters, of course. Luckily, we don't have to admit to ALL of our stash and ALL of our past projects. Hey Ms. Monster Crochet....where are all your crazy, squiggly reptiles and monster veggies on Ravelry? Anyway, I'm excited to be part of this internet knit/crochet resource and will ultimately spend an inordinate amount of time cruising the site. Have you signed up yet? Hope to see you at the WeHo SnB tomorrow night! Remember this sweater? I've been making some progress on it and have reached the point in the top-down process where I've put the sleeve stitches on holders, joined the front to the back and am knitting toward the hem. Now that the weather has cooled down a bit in Los Angeles (78 degrees F. today), it's more comfortable to knit with a bunch of wool in my lap. I do love this color combination. It's Fleece Artist yarn in multi-colors of reddish orange, light olive and burnt sienna, striped with Berroco Ultra Alpaca in olive green. I wear a lot of olive green in the winter, but I don't currently have a good pair of olive green slacks. Finding a pair that would match the olive of the yarn might be futile. I'll stick to my 12 pairs of black slacks. I like that all-one, matchy look. SOOOOO, I thought I'd trim this sweater in a Chanel-like way, using a black boucle' yarn, single crochet around the edges several times. I might even add the Chanel-obligatory trimmed pockets in front...somewhat like this sweater. Fall weather makes me happy. After a very busy Saturday meeting, greeting and listening to The Yarn Harlot, I came home and plotzed on the couch! Our dinner plans had been postponed, so I finally had time to just sit and stare at the wall (or stare at all my UFO's sitting in totebags around the house). Ahhh..peace...that is until Mr. Larry came home. He announced that in about 15 minutes the opening night of SHAG's show at Billy Shire Fine Arts was happening and that we should go. Mr. Larry is one of SHAG's photographers of his incredible paintings, so we do know him and always like to support his art shows in our area. Not that SHAG (Josh Agle) needs any support. In the past few years, his painting prices have sky-rocketed. He's very successful, talented and extremely charming. We trundled over to the art gallery....very close to our house. Inside, Josh's show "Conspicuous Consumption" was swingin'. Josh had built this mini-house, painted it just like the ones in his super-cool, mid-century paintings and furnished it with child-sized modern furniture. It is spectacular! There were also new paintings exhibited and a wall of mini-paintings, bagged and labeled like shop merchandise. The very small paintings were $900 apiece! Yikes! Josh is verrrry successful. 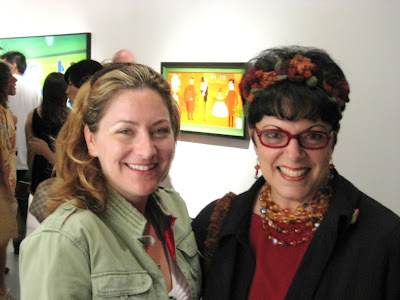 We roamed around a bit, I had my photo snapped with the Artist. I was sitting near the book section of the gallery and this lovely, familiar looking lady came over to say hello. It was Bree from the Triplecreme blog!!! We'd never met, but we've commented on each other's blogs. Bree is a restaurant blogger. 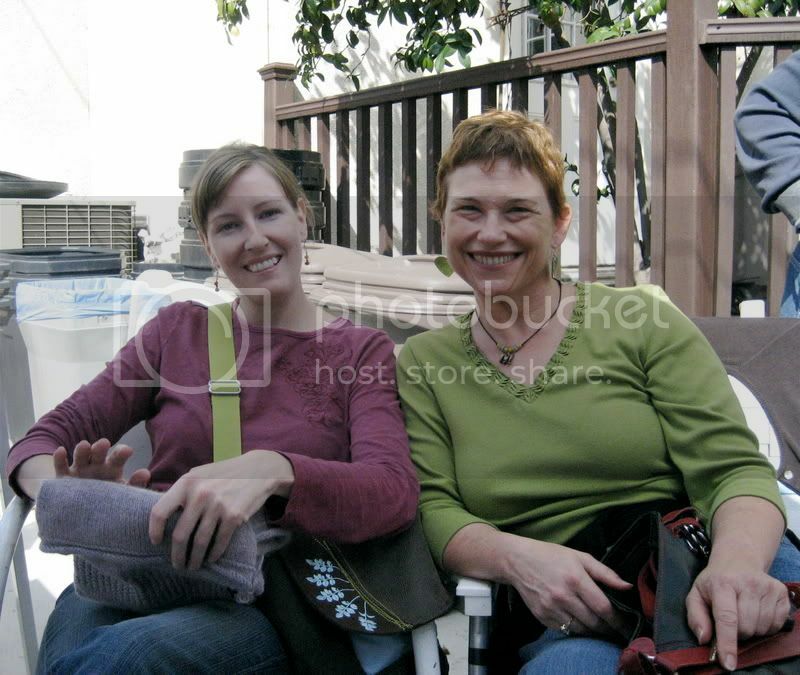 I love reading her posts about local places, especially Culver City, Mar Vista, Santa Monica and the westside. We chatted a bit about the local scene and restaurants in general. Bree informed me that I influenced her to start her food blog! Wow! Thanks for letting me know, Bree. It was great meeting you in such a colorful setting. Hope to see you at the Metro Cafe soon. Today was the day! 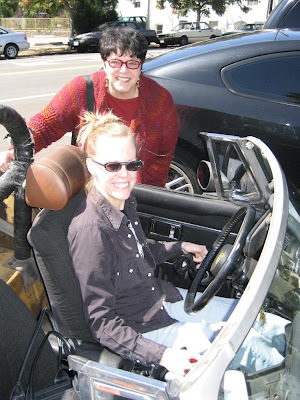 The Yarn Harlot came to Los Angeles and spoke at the LA Central Library, Downtown. I was lucky enough to be asked to introduce her, so I got to meet and speak with Stephanie before all my fellow knitsters! It was awesome. Stephanie Pearl McPhee is a terrific writer and public speaker. She related some hilarious knit-related stories for over an hour today. Everyone truly enjoyed her "performance." I presented Stephanie with my California dishcloth and she graciously posed for a photo. Many of L.A.'s knitters and crocheters were present....thanks to everyone for coming.....thanks to Jeff and Audrey for inviting me to speak.....and thanks to the Library Foundation of Los Angeles for putting on an awesome lecture! We had a good family Rosh Hashonah celebration yesterday. I didn't take any photos, I should have! My Aunt hosted us for lunch and the buffet was sumptious. I saw many old friends from various chapters of my past life. 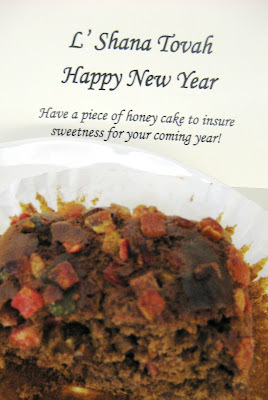 I feel that there will be sweetness for us all in the coming year! 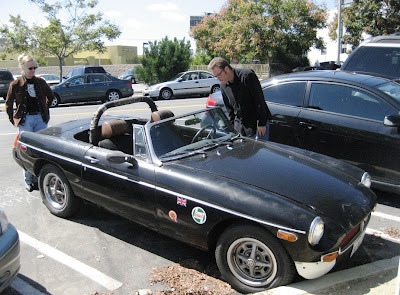 Later, in the early evening, Mr. Larry accompanied me to the Original Farmers Market. Thursday is my WeHo SnB night. 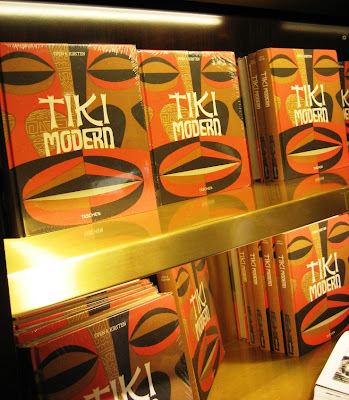 However, our friend Sven Kirsten recently wrote a book called "Tiki Modern" and publishers, Taschen were hosting a book signing event at their little shop in the Farmers Market Clock Tower. WOW! What a scene! The Martini Kings were there, playing hip island music. 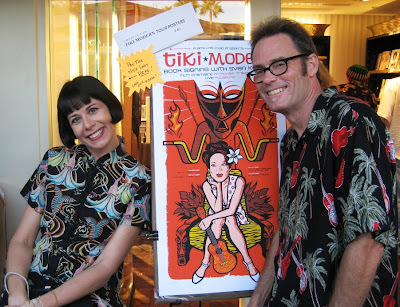 Sven's g.f., Naomi from "Eight Ball" was there, looking tiki-rific. Sven brought his Witco throne/chair and regally signed autographs for hours! The book is great. 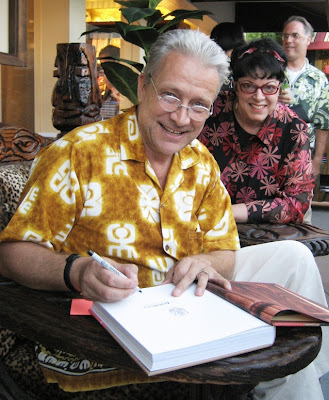 Our friend, Amy Inouye helped with the book design. 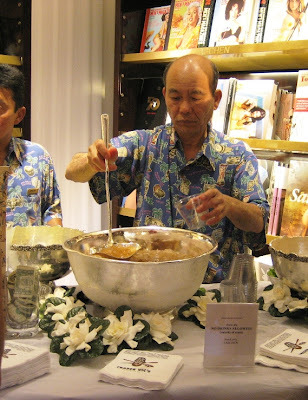 If you ever wanted to know anything at all about tiki culture, this is the book to have. It's chock full of interesting facts, photos and ephemera. Nice work, Sven! In Other News: See y'all at the LA Public Library tomorrow for the Yarn Harlot's only L.A. speaking engagement this year!!!! L' Shana Tovah means Happy New Year in Hebrew. Today at sundown begins the Jewish New Year, Rosh Hashonah. It's traditional to eat sweet food for the celebration to insure that you will have a sweet, successful and happy new year. 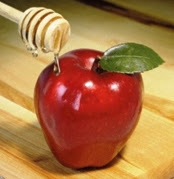 Apples and honey are a favorite. I picked up a delicious honey cake at Fred's Bakery in Beverlywood this morning on my way to the office to share with my co-workers. Fred had the traditional plain honey cake, ones with nuts and then a surprising one with fruit. It was gobbled up quickly....I barely had time to take a photo! 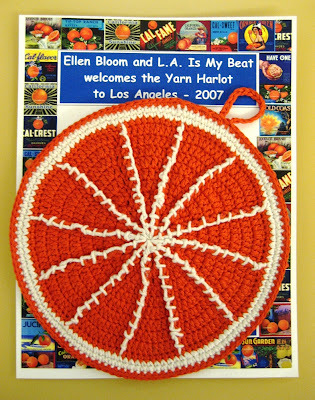 We're all gearing up for the Yarn Harlot's visit to Los Angeles. Stephanie Pearl-McPhee will be speaking at the Central Los Angeles Public Library, Downtown this coming Saturday, September 15th at 2pm. The event is free, but you must have a reservation. For info, check here. My BFF, Chick-in-the-Know and High Priestess of Hip, Madgik, clued me in to the fact that Stephanie collects state dishcloths on her speaking engagements around the country. Hmm? 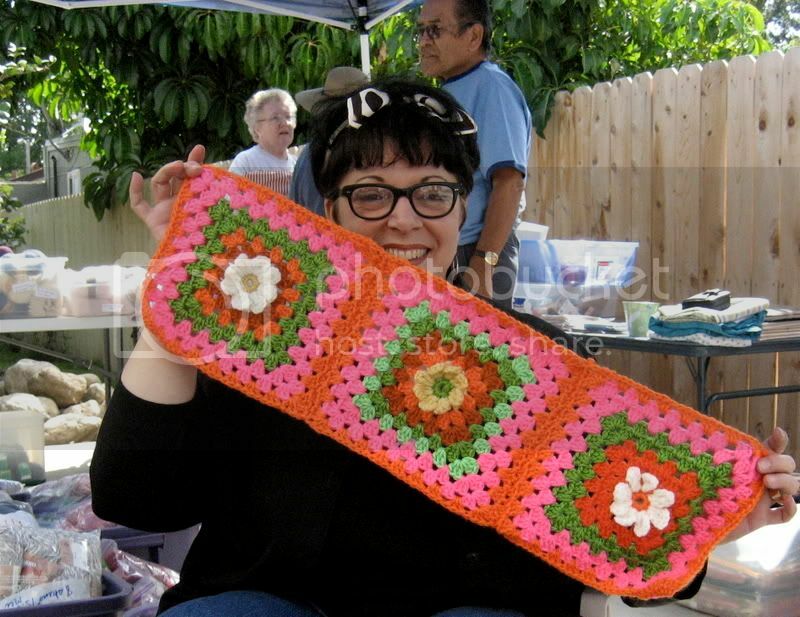 What type of dishcloth could I crochet or knit for The Harlot that would say "California"? An orange, of course!!! 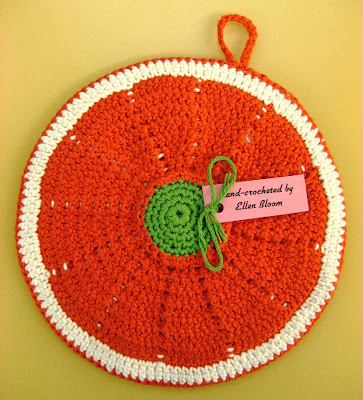 I whipped up a crocheted orange slice dishcloth. Then, I found some old orange crate labels online to use as a background for my giftcard. Thanks for the idea, Madge. I was very excited and honored to be asked to introduce Stephanie by the Library Foundation of Los Angeles (thanks, Jeff and Audrey)! One more reminder for attendees to the Yarn Harlot's lecture on Saturday: When I introduce myself and say, "Hi, my name is Ellen and I'm a yarn-a-holic," I'll need you ALL to yell out, "Hi Ellen!" OK? Thanks and Happy New Year! Many of you know that my husband, Larry Underhill, is a photographer. His photo jobs are varied. He works with architects, preservation groups, artists, art galleries, public relations people, non-profit groups and everyone in-between! 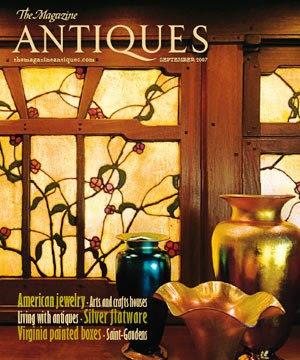 A few months ago a magazine from New York, "The Magazine Antiques" contacted Larry to photograph the Gamble House in Pasadena for a story they were planning. The Gamble House is a craftsman-style home built by architects, Greene and Greene in 1908. It's a very impressive estate and worth visiting. Yesterday, the Magazine sent us the issue containing Larry's photos. One of Larry's photos is on the cover! So exciting!!! Of course, there are many of his photos inside too. It's a story called "Two Arts and Crafts Houses: Paradigms in Pasadena and Boston" by Maureen Meister. The magazine is available for purchase now at your finer newstands. We attended a glorious wedding this past weekend in TiJuana, Mexico. The bride, Charlene Gould and the groom, Chris Nichols truly did a marvelous job of hosting all of us at this momentous event. Chris recently wrote a book. "The Leisure Architecture of Wayne McCallister" about the architect, Wayne McCallister. Mr. McCallister's signature style of incorporating signage into a building's design is evident in the Sands Hotel, Las Vegas and Bob's Big Boy in Toluca Lake, among others. One of McCallister's first assignments as an architect at the age of 19 (!) was to design Agua Caliente Casino and Resort Hotel in TiJuana, Mexico. Charlene and Chris thought this would be a perfect location for their wedding. You can read about the history of Agua Caliente here. This site is no longer a casino, hotel or resort. It has been a private school for decades. I know that the pool area where the wedding reception was held was recently renovated. The tile work, alone is magnificent. There was an 11-piece orchestra and everyone was asked to dress in the period of the resort...1928 - 1935. Everything was marvelous....the setting, the music, the meal and the guests. Check out the wedding website. I just couldn't resist picking up a few skeins of Paton's SWS when I was at the gigantic Michael's in Rancho Mirage this past weekend. 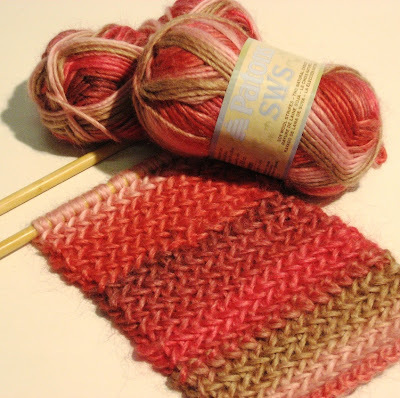 I started a simple scarf with this extremely soft, self-striping yarn, but then decided I didn't like it. I tried crocheting with it...too thick for the hooks I had on hand. 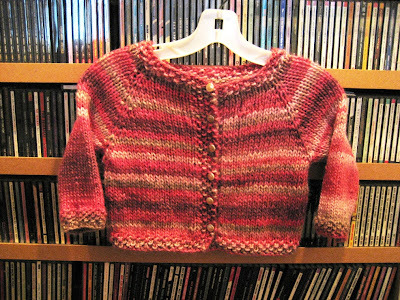 So, I cast on a top-down toddler sweater. I just love how this colorway, "Natural Geranium" stripes! I finsihed this quickly, added some pearly buttons. All I need to do is block lightly and some lucky little girl toddler (probably my cousin Avery) will be modeling this soon. Project Specs: 2 skeins, Paton's SWS, Natural Geranium. Size 11 circular needles. 5 pearly buttons. Cast on 60, divided with markers for top-down contruction. 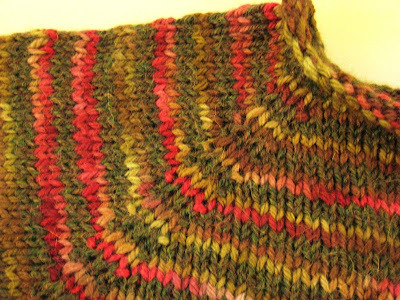 Seed stitch for neckline, bottom of sweater and sleeve ends. Yes, Natalie!!! I've been working on poor Larry's green cardi, off and on. I'm hoping to finish it by the end of September!!! Oh Yeah...when I see a pattern that inspires me, I need to try it out...in a heartbeat...fast! WELLLLL, awhile back I saw the Heartbeat Sweater on Ellene's blog. G*O*R*G*E*O*U*S! 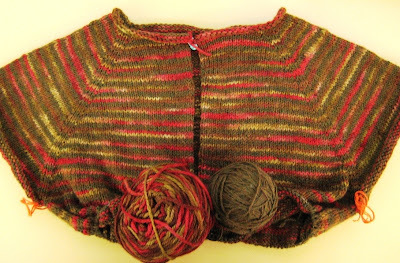 When I clicked on Ellene's link to the pattern, I was glad I saw the sweater first on her blog. Her color combos and photography are so much more inspiring. Then I clicked around a bit and found some other examples. I had to try this pattern. 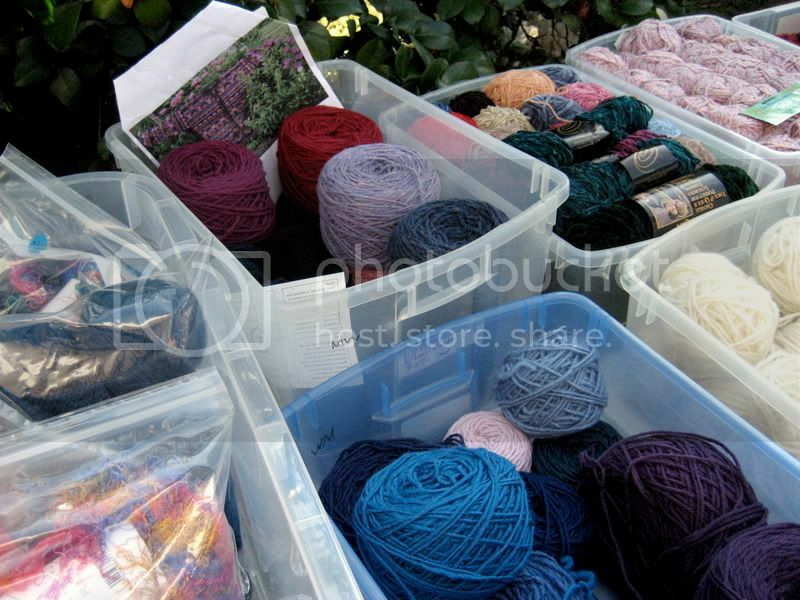 I was sure I could find some yarn in my stash to whip it up. So, I pulled out some colorful Homespun in Halloween--Thanksgiving colors and started stitchin'. 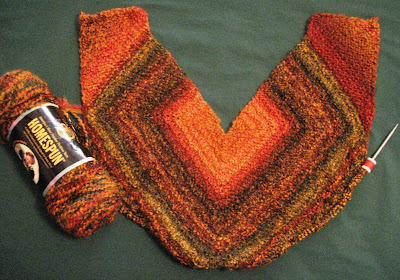 I love variegated yarn, but horizontal stripes aren't too flattering for my figure-type, so when the pattern for the Heartbeat started to emerge, I was happy to see such a grand diagonal! I'm done with the front, have decided to knit the back differently, so the sweater will fit better. One of these days I'll finish up and wear my Heartbeat over my heart! Thanks for the inspiration, Ellene! Woo Hoo! The Pinkberry at the Original Farmers Market is finally open!!! I'm happy and I'm sad. 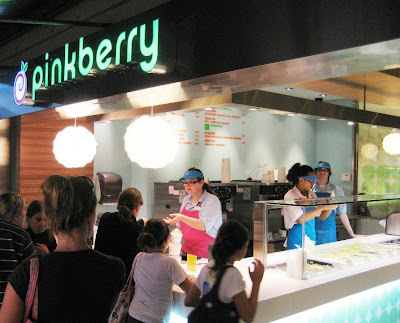 I love Pinkberry, but I'm sad to see the old-time vendors gone. Two vegetable stands and the old pharmacy are gone. I suppose the F. Mkt. is getting away from being a farmer's produce market. Starbucks and Pinkberry are chainstores located inside the old F. Mkt. 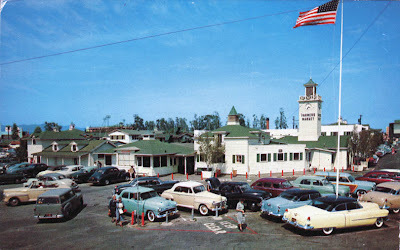 It was the end of an era when The Grove was built next door. The Grove is full of chain stores. At least the individuality of the architecture at the Original F. Mkt. remains intact. There are numerous restaurants inside the F. Mkt. Since I'm there at least twice a week, I frequent many of them. My favorites are Pampas Grill, Mr. Marcel, Singapore's Banana Leaf, Magees Kitchen and Phil's Deli. 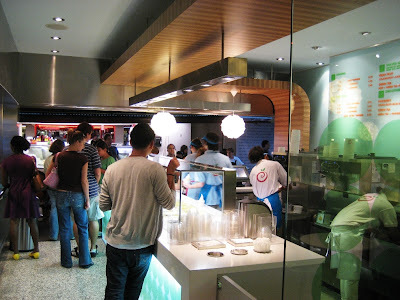 This week, I'll be dining solely on Pinkberry for dinner. Join me?